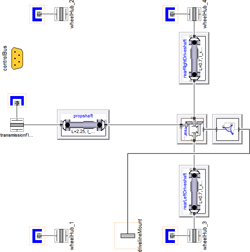 This Modelica library provides standard interface definitions for automotive subsystems and vehicle models. These are designed to promote compatibility between the various automotive libraries and provide a flexible, powerful structure for vehicle modelling. The focus of the library is on defining the interfaces for the individual subsystems (engine, driveline, chassis, etc.) and a number of vehicle model examples are included to demonstrate how they are used. 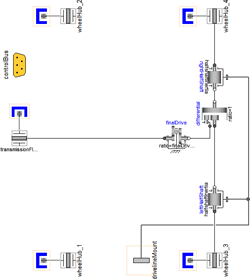 For each of the vehicle subsystems the connections to other subsystems are standardised but still allow the model fidelity to vary significantly. For example, the driveline could be modelled as a simple 1D Rotational system as in the Vehicle Interfaces basic example but it can also be modelled as a detailed MultiBody system as in the VeSyMA – Powertrain example. The Vehicle Interfaces library is compatible with and used by all the automotive applications libraries available from Claytex. These include the VeSyMA solution suite and Electrified Powertrains Library.